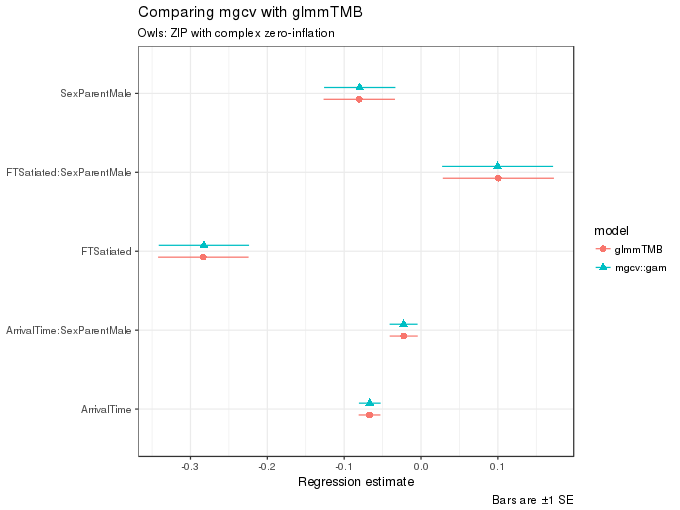 A couple of days ago, Mollie Brooks and coauthors posted a preprint on BioRχiv illustrating the use of the glmmTMB R package for fitting zero-inflated GLMMs (Brooks et al., 2017). 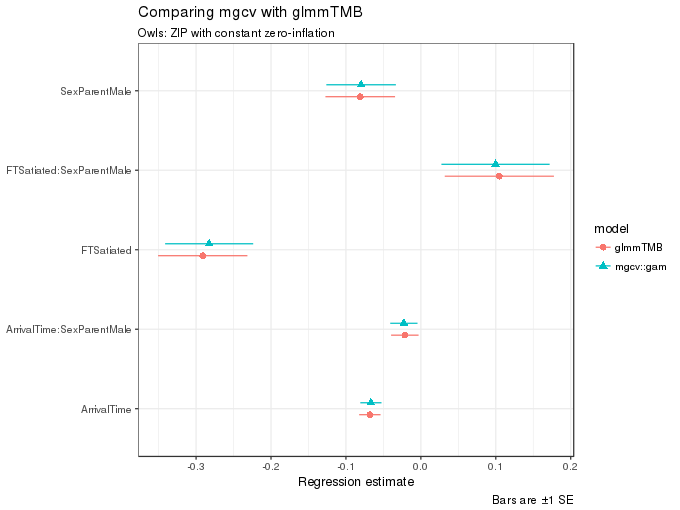 In the paper, glmmTMB is compared with several other GLMM-fitting packages. mgcv has recently gained the ability to fit a wider range of families beyond the exponential family of distributions, including zero-inflated Poisson models. mgcv can also fit simple GLMMs through a spline equivalent of a Gaussian random effect. 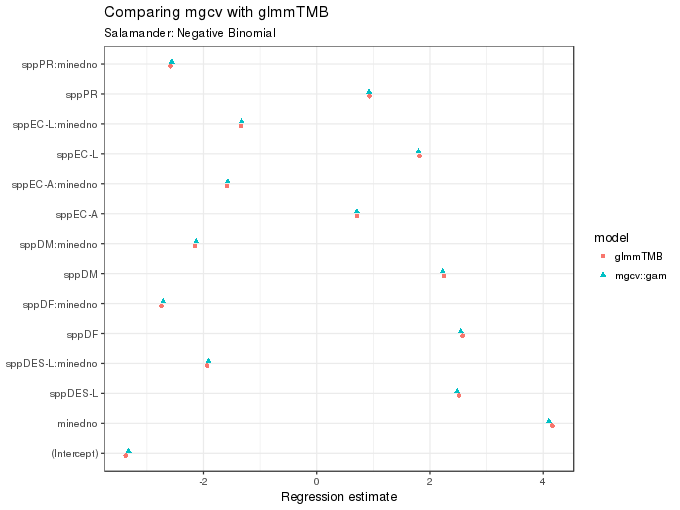 So, whilst I was waiting on some Bayesian GAMs to finish sampling, I decided to see how mgcv compared against glmmTMB on the two examples used in the paper. For this post I'll be using a couple of packages beyond glmmTMB and mgcv; make sure you have ggplot2 and ggstance installed if you wish to run through the code below. Given this duality between splines and random effects, you can reverse the idea and create a spline basis that is the equivalent of a simple Gaussian i.i.d random effect, such that you can fit a GLMM or GAMM using GAM software like mgcv. mgcv has the re basis for this, and I'll exploit that to fit the zero-inflated GLMMs to the two examples. Salamanders --- Seven combinations of different salamander species and life-stages were repeatedly sampled four times at 23 sites in Applachian streams (Price et al., 2016). Some of the streams were impacted by mountaintop removal and valley filling from coal mining. The data are available from Price et al. (2015), as well as the glmmTMB package. Owls --- the second example is a well-studied one in mixed modelling papers and textbooks (Zuur et al., 2009, Bolker et al. (2013)), and relates to the begging behaviour of owl nestlings. The data were originally reported in Roulin and Bersier (2007). Brooks et al. (2017) fit several count models to the Salamander data set, including standard Poisson GLMMs, negative binomial GLMMs, with \(\theta\) estimated and modelled via a linear predictor, as well as zero-inflated Poisson (ZIP) and zero-inflated negative binomial (ZINB) models. Of these, gam() can currently fit all but the negative binomial with \(\theta\) modelled via a linear predictor and the ZINB models. As glmmTMB() is currently only capable of fitting models using maximum likelihood, not REML, I use the Laplace approximate maximum likelihood estimation method for gam(). The new nb family in mgcv is for the negative binomial distribution with the (fixed) dispersion parameter \(\theta\) estimated as a model parameter, in the same way that MASS::glm.nb() and lme4::glmer.nb() models do. In the gam() model, the random effect is specified using the standard s() smooth function with the "re" basis selected. The named variable, here site, should be stored as a factor in the data object to avoid problems. 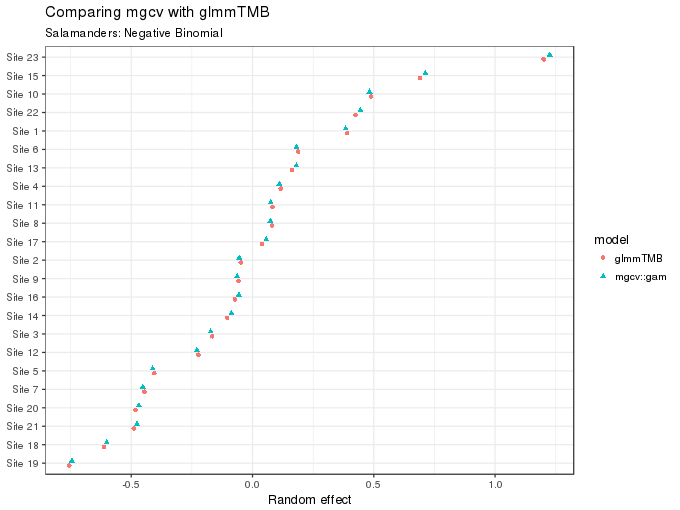 The summary() output for the glmmTMB() model conveniently provides some additional useful information, in the context of GLMMs most notably the estimated variances (or standard deviations) of the random effect terms. As gam() wasn't designed with GLMMs specifically in mind, the same information is not provided in the the summary() method for gam() model fits. However, Simon Wood has provided the gam.vcomp() function, which can be used to return the variance components of the model in a way that allows comparison with other mixed-models specific software. To recreate part of Figure B.3 in Appendix B (Brooks et al., 2017), the code below predicts from the fitted gam() model for all combinations of the factors mined and spp. Notice how we have to specify a site in the prediction data, otherwise predict() will throw a tantrum. To set the random effect for site to zero, use the exclude argument. To exclude (i.e. set to zero) any model term, you supply a character vector or list of terms to exclude. For smooth terms, these must be named as they appear in summary(model), hence the use of "s(site)". The final step is to call predict() with type = "link". This will return a two column matrix (or a list of two-column matrices if se.fit = TRUE is also used). The comparisons shown above show that mgcv::gam() and glmmTMB() produce very similar estimates for the two models. And some crude timings showed that gam() was 20--40% faster than glmmTMB() at fitting the examples discussed in the paper. So all is roses, right!? Who needs glmmTMB()? And that's fine; gam() was not designed to fit GLMMs --- there are no less than three implementations by Simon Wood alone of functions to fit GAMs with complex random effects in mixed model software (gamm() to fit with lme(), gamm4() to fit using lmer() and glmer(), and jagam() in mgcv to fit via JAGS). Furthermore, glmmTMB() is currently more flexible in the range of models that it can fit than any these implementations, except for JAGS, because the nb, Zip, and ziplss families only work with gam(). What the above comparison illustrates, however, is that if you either don't have complex or many random effects or that you don't mind running models overnight, gam() is a good option for fitting GLMMs. Plus you have the advantage of estimating smooth functions of covariates, which is one area where glmmTMB() is currently very lacking compared to gam(). Finally, this was a fun exercise to replicate the analyses in Brooks et al. (2017), motivated by a desire to understand what mgcv and gam() are doing with these random effect splines. It wasn't intended as a prize-fight between two title contenders --- hopefully this write-up didn't come across that way. I also learned a lot more about glmmTMB, which is shaping up nicely and looks like it'll have a place in my modelling toolbox. Bolker, B. M., Gardner, B., Maunder, M., Berg, C. W., Brooks, M., Comita, L., et al. (2013). 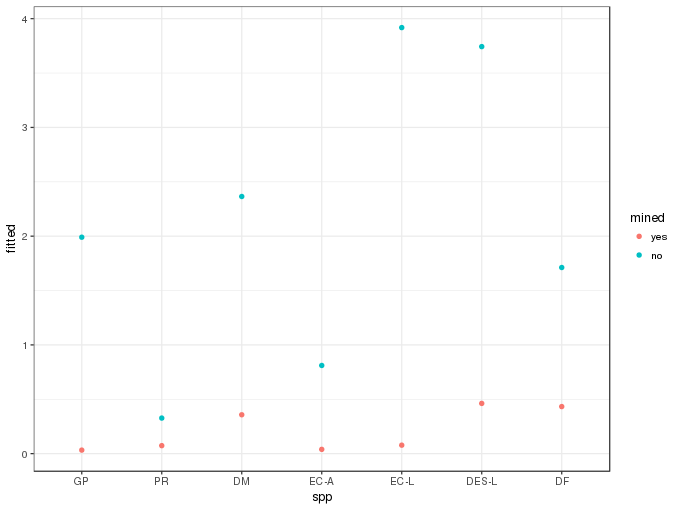 Strategies for fitting nonlinear ecological models in r, AD model builder, and BUGS. Methods in ecology and evolution / British Ecological Society 4, 501–512. doi:10.1111/2041-210X.12044. Brooks, M. E., Kristensen, K., Benthem, K. J. van, Magnusson, A., Berg, C. W., Nielsen, A., et al. (2017). Modeling Zero-Inflated count data with glmmTMB. bioRxiv, 132753. doi:10.1101/132753. Price, S. J., Muncy, B. L., Bonner, S. J., Drayer, A. N., and Barton, C. D. (2015). Data from: Effects of mountaintop removal mining and valley filling on the occupancy and abundance of stream salamanders. doi:10.5061/dryad.5m8f6. Price, S. J., Muncy, B. L., Bonner, S. J., Drayer, A. N., and Barton, C. D. (2016). Effects of mountaintop removal mining and valley filling on the occupancy and abundance of stream salamanders. The Journal of applied ecology 53, 459–468. doi:10.1111/1365-2664.12585. Wood, S. N., Pya, N., and Säfken, B. (2016). Smoothing parameter and model selection for general smooth models. Journal of the American Statistical Association 111, 1548–1563. doi:10.1080/01621459.2016.1180986. Zuur, A. F., Ieno, E. N., Walker, N., Saveliev, A. A., and Smith, G. M. (2009). Mixed effects models and extensions in ecology with r: Springer New York doi:10.1007/978-0-387-87458-6.